The Parson Russell Terrier was originally a working terrier that would go to ground after foxes, not to finish the kill, but to bolt them back out for the waiting pack hounds. Still sometimes used in this fashion, today it is more commonly found around the world as a companion. The history of the Parson Russell Terrier coincides with that of the Jack Russell Terrier. Although both the short and long legged types were originally known as the Jack Russell, the Parson Russell was the first of the two that was recognized by kennel clubs. The naming of the two breeds has been debated among kennel and breed clubs and still causes confusion. 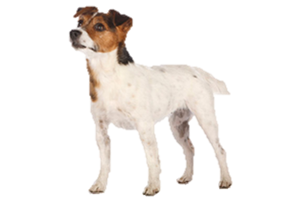 Most consider the longer legged version as the Parson Russell Terrier and the shorter as the Jack Russell Terrier, however the American Kennel Club (AKC) recognizes the shorter as simply the Russell Terrier. Is the Parson Russell Terrier Right for You?